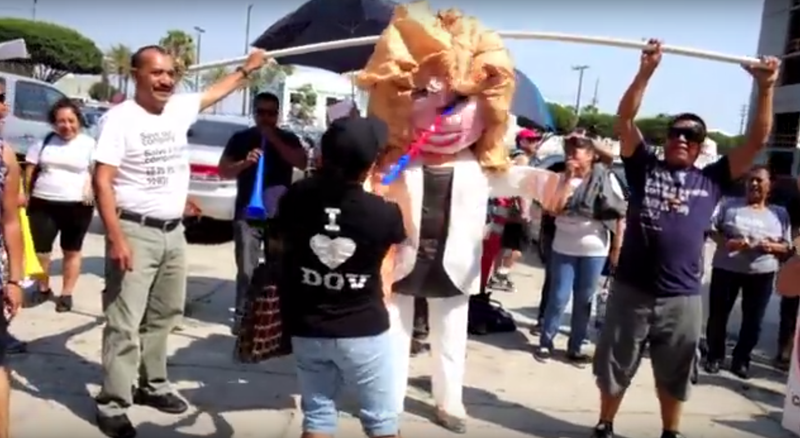 Things are most definitely not going well at American Apparel, a notion rendered bizarrely concrete by a demonstration held last week in which a piñata likeness of CEO Paula Schneider was hacked apart by workers wearing “I <3 Dov” t-shirts outside the company’s headquarters. A significant amount of unrest has plagued the company since Schneider came in to replace Charney, who was officially ousted in December; when I spoke to employees in March, they were already furious about Schneider’s corporate, slightly removed management style, a series of costly and uninspired hires, and most of all, the fact that not one member of the board (hedge fund Standard General replaced 5 of 9 members with their own appointees after Charney’s ouster) had substantial experience with apparel manufacturing. Since then, American Apparel has undergone mass layoffs and has significantly reduced the hours and personnel at the American Apparel factory, causing many to push back against the company’s continued use of the phrase “sweatshop-free.” The General Brotherhood of Workers of American Apparel formally registered with the U.S. Department of Labor earlier this month, and has officially asked the company for recognition (as of Friday, they’ve received no response). Some of you wonder why Esmerelda Morales was terminated. The fact is that Esmerelda sent me a very threatening and disturbing email showing a war zone of people getting blown up. This is intimidation and not acceptable workplace behavior from anyone as is clearly outlined in our business code of conduct. In addition, a group showed up at one of our stores last Saturday to picket a retail store event (to increase sales) and harassed our employees at the store. We have heard that the plan is to now focus on picketing our retail stores. In fact the picketers left here yesterday afternoon and picketed our Little Tokyo location. This resulted in customers leaving our store. If this continues we will lose sales and lost sales mean lost jobs. I would encourage all of our employees to support our company, and not tear it down. What appears to be a shorter, earlier version of this memo was posted on the Workers Together Save American Apparel website, alongside a response from GBWAA and Hermandad Mexicana, an advocacy organization that has helped with union efforts. These heightened, ill-advised tactics on the part of American Apparel’s workers are not particularly surprising, considering the personality of the man whose cause they continue to champion. But although bashing apart an effigy of their loathed female CEO is crude, melodramatic, scans as misogyny and ultimately undermines their own cause, what remains is this: a company that was doing poorly is now doing worse, and many of its employees are no longer making a living wage. Their tactics are terrible, but they’re angry for a reason.